Villa Ganz Boutique Hotel was converted from a mansion built in the 1930s. It belonged to the grandparents of Mexican golfer Lorena Ochoa, the top-ranked female golfer in the world for 158 consecutive and total weeks (both are LPGA Tour records), from April 2007 to her retirement in May 2010. As the first Mexican golfer of either gender to be ranked number one in the world, she is considered the best Mexican golfer and the best Latin American female golfer of all time. After a complete renovation, the restored 1930s villa built around a high-walled garden and courtyard opened in 2001. The result is a charming hotel with ten spaciously unique, and distinctively decorated suites. The garden located in the rear of the property, with a lounging area and fireplace, is a welcome escape from the busy boulevard out front. A buffet breakfast of fruits, cereals, and yogurts is served in the mornings. Lunch and dinner can be enjoyed onsite, through food delivery, or in nearby neighborhood restaurants and cafes. The central lobby is full of books in multiple languages, and guests can enjoy hot coffee and snacks in the morning, and chilled wine each evening. The hotel is located in what some regard as the most beautiful part of Guadalajara, the Zona Rosa, or Pink Zone. Many of the colonial mansions here have been magnificently restored as shops, upscale office space, or in this case, as a luxury boutique hotel. 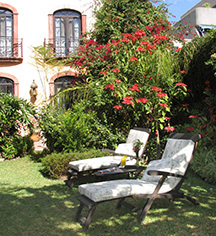 While Villa Ganz delivers comfort and convenience with style, it is a welcome starting point for exploring Guadalajara and its many neighboring towns. Tlaquepaque, only a cab ride away, is the historic pedestrian-only area lined with beautiful colonial houses, converted into art and furniture galleries, craft stores, and restaurants. Guadalajara’s historic downtown is another notable stop to see the masterpiece ceiling murals by Jose Clemente Orozco in the UNESCO-listed Cabañas Cultural Institute. 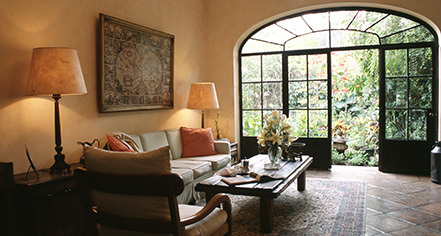 Villa Ganz is a distinguished member of the Mexico Boutique Hotels association since it opened in 2001. The hotel was named a Fodor´s Choice establishment from 2008 to 2011. It has earned the AAA Four Diamond award for nine consecutive years.